The South Norwalk Community Center, a.k.a. 98 South Main St.
NORWALK, Conn. — South Norwalk activists turned out for Tuesday’s Common Council meeting only to learn that the issue that attracted them would not be discussed. 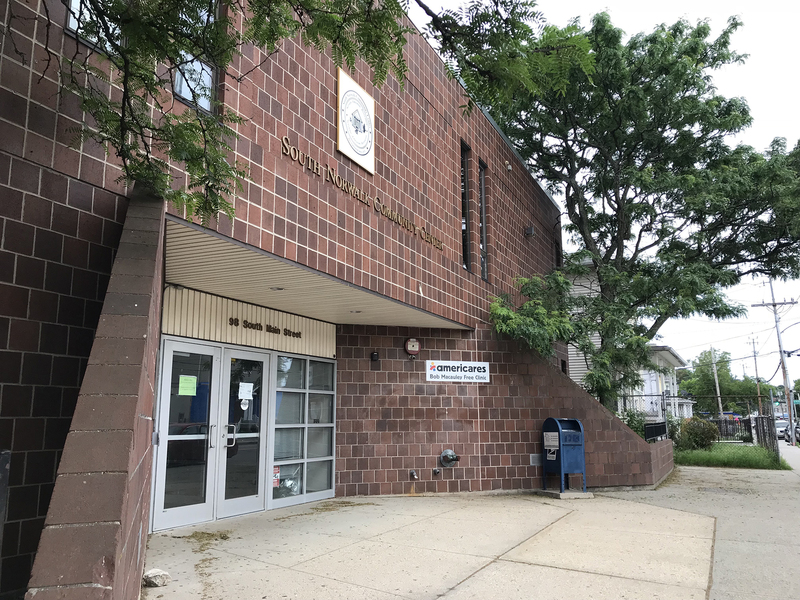 The executive discussion scheduled on the proposal for the City to buy the South Norwalk Community Center’s half of 98 South Main St. was postponed. Council members knew Monday evening they would do that after the Board of Estimate and Taxation did not move the item ahead, Diane Lauricella and others said. The BET voted Monday but it was a tie vote, Mayor Harry Rilling said after the meeting. “They had some questions that they needed answered,” he said. The City has proposed buying SoNoCC’s half of 98 South Main for $300,000 and spending an additional $200,000 on building repairs. The purchase and repairs would be funded from the $3.5 million paid by GGP to the City this year in exchange for permission to eliminate a hotel from plans for The SoNo Collection. Rilling and Council have spoken numerous times of spending the $3.5 million in ways that would benefit South Norwalk. The building at 98 South Main was built with $1 million of grants obtained by the city between 1981 and 1987. Ownership of the property was transferred to Norwalk Economic Opportunity Now (NEON) and SoNoCC in August 1987, with each organization owning half of the building. The proposed purchase stems from NEON’s bankruptcy, which was settled a year ago, with the City gaining ownership of NEON’s half of the building. The proposed deal includes a new organizational structure for the South Norwalk Community Center, with the appointment of a new 11-member Board. South Norwalk representatives Travis Simms and Ernie Dumas on Tuesday afternoon released an opinion saying that the deal should not be approved. Tuesday’s meeting drew eight or nine South Norwalk residents, including District B Democrats Chairman Bobby Burgess and State Rep. Bruce Morris (D-140). “This is twice now that this has been put on the agenda and taken off. I hope that would give people pause,” Morris said. There’s an “issue of transparency and being convenient to the taxpayers,” Morris said, agreeing with Lauricella’s comment that the public should have been informed that the vote would not happen Tuesday. Morris said he agreed that something needs to be done about the ownership of the building, but noted that other groups are interested besides SoNoCC. He reminded NancyOnNorwalk that there had been a proposal last fall that involved Mount Zion Baptist Church, the YMCA and state bonding. Corporation Counsel Mario Coppola said after the meeting that the South Norwalk Community Center Board of Directors would not control the building. SoNoCC would have a 700-square foot office in the building, he said. The BET asked if a new environmental assessment and a new appraisal had been done on the property, Rilling and Coppola said. “We’re going to get them the information,” Coppola said. building looks nice yet behind it residents are smelling raw sewage in Washington village, why does the city treat south Norwalk residents like animals? This open hole with sewage has been like this for weeks , so its not like Im asking like we just found it. The open hole 6 feet from open windows in Washington village must smell nice on a night like tonight. Guess if your a Rilling supporter it doesn’t smell where your reading this. new news on the environment is coming the ball started friday. Why are they working om NEON and its parking lot before the environmental assessment has been accepted by the EPA? Why is the RDA paying for everything? The city has ignored a lot of stuff you know with the mall coming not much concern any more for the residents it seems. Does Norwalk need a permit for a Rat farm on day st? 2 floor were the energy program was, to get assistance with all resource.